Thomas Arnold was appointed headmaster of Rugby in 1828. He had a profound and lasting effect on the development of public school education in England. Arnold introduced mathematics, modern history and modern languages and instituted the form system and introduced the prefect system to keep discipline. He modernized the teaching of Classics by directing attention to literary, moral or historical questions. Although Arnold held strong views, he made it clear to his students they were not expected to accept those views, but to examine the evidence and to think for themselves. Arnold also emphasized the importance of sport in young men's education. Like most headteachers in public schools, Arnold believed that sport was a good method for "encouraging senior boys to exercise responsible authority on behalf of the staff". He also argued that games like football provided a "formidable vehicle for character building". Each school had its own set of rules and style of game. In some schools the ball could be caught, if kicked below the hand or knee. If the ball was caught near the opposing goal, the catcher had the opportunity of scoring, by carrying it through the goal in three standing jumps. Rugby, Marlborough and Cheltenham developed games that used both hands and feet. The football played at Shrewsbury and Winchester placed an emphasis on kicking and running with the ball (dribbling). School facilities also influenced the rules of these games. Students at Charterhouse played football within the cloisters of the old Carthusian monastery. As space was limited the players depended on dribbling skills. Whereas schools like Eton and Harrow had such large playing fields available that they developed a game that involved kicking the ball long distances. According to one student at Westminster, the football played at his school was very rough and involved a great deal of physical violence: "When running... the enemy tripped, shinned, charged with the shoulder, got down and sat upon you... in fact did anything short of murder to get the ball from you." Football games often led to social disorder. As Dave Russell pointed out in Football and the English (1997), football had a "habit of bringing the younger element of the lower orders into public spaces in large numbers were increasingly seen as inappropriate and, indeed, positively dangerous in an age of mass political radicalism and subsequent fear for public order." Action was taken to stop men playing football in the street. The 1835 Highways Act provided for a fine of 40s for playing "football or any other game on any part of the said highways, to the annoyance of any passenger." In 1840 soldiers had to be used to stop men playing football in Richmond. Six years later the Riot Act had to be read in Derby and a troop of cavalry was used to disperse the players. There were also serious football disturbances in East Molesey, Hampton and Kingston-upon-Thames. Although the government disapproved of the working-classes playing football, it continued to be a popular sport in public schools. In 1848 a meeting took place at Cambridge University to lay down the rules of football. As Philip Gibbons points out in Association Football in Victorian England (2001): "The varying rules of the game meant that the public schools were unable to compete against each other." Teachers representing Shrewsbury, Eton, Harrow, Rugby, Marlborough and Westminster, produced what became known as the Cambridge Rules. One participant explained what happened: "I cleared the tables and provided pens and paper... Every man brought a copy of his school rules, or knew them by heart, and our progress in framing new rules was slow." It was eventually decided that goals would be awarded for balls kicked between the flag posts (uprights) and under the string (crossbar). All players were allowed to catch the ball direct from the foot, provided the catcher kicked it immediately. However, they were forbidden to catch the ball and run with it. Only the goalkeeper was allowed to hold the ball. He could also punch it from anywhere in his own half. Goal kicks and throw-ins took place when the ball went out of play. It was specified that throw-ins were taken with one hand only. It was also decided that players in the same team should wear the same colour cap (red and dark blue). Sometimes public schools played football against boys from the local town. Although these games often ended in fights, it did help to spread knowledge of Cambridge Rules football. Former public school boys also played football at university. Many continued to play after finishing their education. Some joined clubs like the Old Etonians, Old Harrovians and the Wanderers (a side only open to men who had attended the leading public schools), whereas others formed their own clubs. For example, former pupils of the Sheffield Collegiate School established the Sheffield Football Club at Bramall Lane. In 1857 they published their own set of rules for football. These new rules allowed for more physical contact than those established in Cambridge. Players were allowed to push opponents off the ball with their hands. It was also within the rules to shoulder charge players, with or without the ball. If a goalkeeper caught the ball, he could be barged over the line. In 1862 a new set of rules were established at Cambridge University. These specified 11-a-side, an umpire from each side plus a neutral referee, goals 12ft across and up to 20ft high. An offside rule was added. A man could play a ball passed to him from behind, so long as there were three opponents between him and the goal. It was also decided that each game should only last one hour and a quarter. The first game under these rules took place between the Old Etonians and Old Harrovians in November, 1862. A photograph of the Uppingham team. At that time the team played 15-a-side. 1. A goal is scored whenever the ball is forced through the goal and under the bar, except it be thrown by hand. 2. Hands may be used only to stop a ball and place it on the ground before the feet. 3. Kicks must be aimed only at the ball. 4. A player may not kick the ball whilst in the air. 5. No tripping up or heel kicking allowed. 6. Whenever a ball is kicked beyond the side flags, it must be returned by the player who kicked it, from the spot it passed the flag line, in a straight line towards the middle of the ground. 7. When a ball is kicked behind the line of goal, it shall be kicked off from that line by one of the side whose goal it is. 8. No player may stand within six paces of the kicker when he is kicking off. 9. A player is ‘out of play’ immediately he is in front of the ball and must return behind the ball as soon as possible. If the ball is kicked by his own side past a player, he may not touch or kick it, or advance, until one of the other side has first kicked it, or one of his own side has been able to kick it on a level with, or in front of him. 10. No charging allowed when a player is ‘out of play’; that is, immediately the ball is behind him. Thring published his rules under the title, The Simplest Game. Some teachers liked this non-violent approach and several schools adopted Thring's rules. 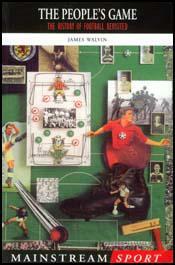 The Football Association was established in October, 1863. The aim of the FA was to establish a single unifying code for football. The first meeting took place at the Freeman's Tavern in London. The clubs represented at the meeting included Barnes, Blackheath, Perceval House, Kensington School, the War Office, Crystal Palace, Forest (later known as the Wanderers), the Crusaders and No Names of Kilburn. Charterhouse also sent an observer to the meeting. In 1866 the offside rule was altered to allow a player to be onside when three of opposing team are nearer their own goal-line. Three years later the kick-out rule was altered and goal-kicks were introduced. In 1871, Charles W. Alcock, the FA Secretary, announced the introduction of the Football Association Challenge Cup. It was the first knockout competition of its type in the world. Only 15 clubs took part in the first staging of the tournament. It included two clubs based in Scotland, Donington School and Queen's Park. In the 1872 final, the Wanderers beat the Royal Engineers 1-0 at the Kennington Oval. 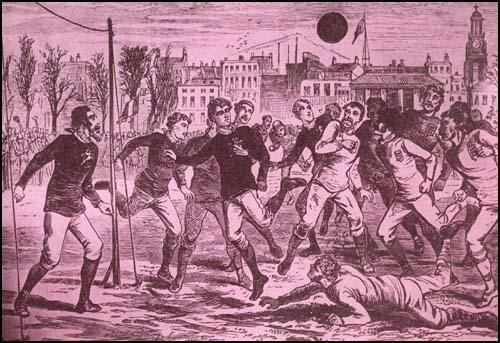 The 1870s saw several changes to Football Association rules. In 1870 eleven-a-side games were introduced with the addition of a goalkeeper. 1871 also saw the introduction of umpires and a neutral referee. Both sides were allowed to appoint an umpire to whom players could appeal to about incidents that took place on the pitch. However, the FA rule now stated: "Any point on which the umpires cannot agree shall be decided by the referee". In 1872 the FA published an updated set of laws. This made it clear that "a goal shall be won when the ball passes between the goal posts under the tape, not being thrown, knocked on, or carried." The new rules clearly distinguished between goalkeepers and other players: "A player shall not throw the ball nor pass it to another except in the case of the goalkeeper, who shall be allowed to use his hands for the protection of his goal... No player shall carry or knock on the ball; nor shall any player handle the ball under any pretence whatever." England against Scotland in 1877. Note the lack of crossbars and nets. The FA Cup helped to popularize the game of football. Up until this competition only fifty clubs were members of the Football Association and played by their rules. This included teams who played as far away as Lincoln, Oxford and York. The main rival to the FA was the 26-member Sheffield Association. Other football clubs were totally independent and played by their own set of rules. In 1877 the clubs in Sheffield decided to join the FA and by 1881 its membership had risen to 128. The FA continued to adapt the rules of the game. In 1882 all clubs had to provide crossbars. Ten years later goal nets became compulsory. This reduced the number of disputes as to whether the ball had crossed the goal-line or passed between the posts. In 1885 it was decided by the Football Association that clubs could play professionals in the FA Cup competition. It was not long before football clubs had large wage bills to play. It was therefore necessary to arrange more matches that could be played in front of large crowds. In March, 1888 it was suggested that "ten or twelve of the most prominent clubs in England combine to arrange home and away fixtures each season." The following month the Football League was formed. It consisted of six clubs from Lancashire (Accrington, Blackburn Rovers, Burnley, Everton and Preston North End) and six from the Midlands (Aston Villa, Derby County, Notts County, Stoke, West Bromwich Albion and Wolverhampton Wanders). In the 1880s football was introduced into most state schools. It could be played on any hard surface and that was especially attractive to those schools that did not have access to playing fields. As a high percentage of the children were physically underdeveloped and undernourished, soccer was considered to be more suitable than rugby. The role of the referee changed in 1891. He moved onto the pitch from the touchline and took complete control of the game. The umpires now became linesmen. 1891 also saw the introduction of the penalty kick. As Dave Russell has pointed out in Football and the English (1997) that this new rule "bitterly upset many amateurs, who argued that the new legislation assumed that footballers could be capable of cheating." The shoulder charge remained an important part of the game. This could be used against players even if they did not have the ball. If a goalkeeper caught the ball, he could be barged over the line. As a result, goalkeepers tended to punch the ball a great deal. In 1894 the Football Association introduced a new law which stated that a goalkeeper could only be charged when playing the ball or obstructing an opponent. In September, 1898, the South Essex Gazette reported that in a game against Brentford, two West Ham United players, George Gresham and Sam Hay, "bundled the goalkeeper into the net whilst he had the ball in his hands". The goal stood because this action was within the rules at the time. 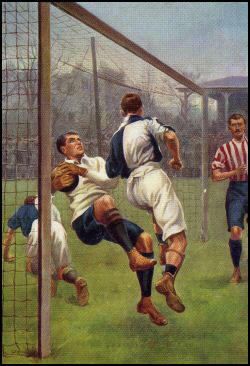 goal line in a game in 1904. Goalkeepers were allowed to handle, but not carry, the ball anywhere in their own half of the field. For example, Tommy Moore, who played for West Ham United, between 1898 to 1901, often moved up field and started an attack by punching the ball into the opposition half. In a game against Chesham, the game was so one-sided that Moore spent most of the game on the offensive. As the local newspaper reported: "Moore had so little to do that he often left his goal unprotected and played up with the forwards." The strategy of using an attacking goalkeeper came to and end in 1912 when the Football Association introduced a new rule that stated that they could only handle the ball inside the penalty area.